Use a green flight card for any event flight and you will entered for a draw from the prize pool. In addition we will have at least two large rocket launches on M motors. This is an excellent launch to invite new people, especially any student or teacher who might consider the Team America Rocketry Challenge. This will be a fun event, and was one of my suggestions for this year. Warp Factor flights are achieved by flying a production kit using motors exceeding the total impulse that the kit was designed for. This usually involves modification to add larger motor mounts or clusters. Some kits can be flown Warp Factor without modification by using 18mm D or 24mm F Aerotech motors. The Warp Factor of the flight is determined by how big of a motor you fly. The Extes Fat Boy is a good example. The stock motor mount is for C motors. Fly an Aerotech D for Warp Factor 2. Seven Cs gives a Warp Factor of 7. Five Ds is a Warp Factor 10. Fly an H for a Warp Factor 32. Flyer with the highest Warp Factor wins bragging rights. Sometimes Warp Factor flights do not return from hyperspace and are lost forever. Remember, more motor in back means you may need more weight up front, so don’t forget to check your CG / CP relationship. An easy way to do this is to find the CG on the stock kit, and add nose weight to make sure its in the same place with the bigger motors. Maiden voyages or unproven designs should go through RSO inspection. 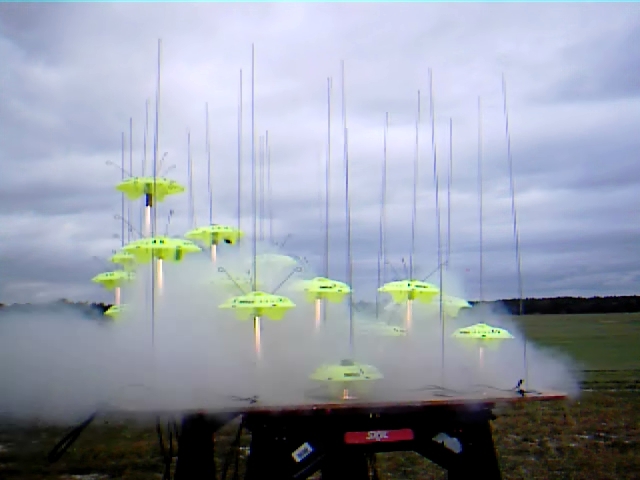 You are currently browsing the SouthEast Alabama Rocketry Society weblog archives for August, 2009.